Swingers Westend Celebrates First Birthday! ONIN London > Entertainment > Swingers Westend Celebrates First Birthday! 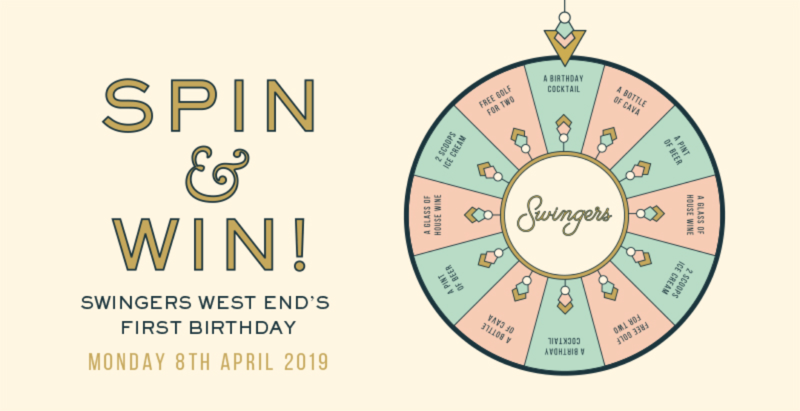 On Monday 8th April, Swingers West End will be celebrating its 1st birthday with half price crazy golf and the chance for everyone to spin the Swingers ‘Wheel of Fortune’ – where EVERYONE wins a prize! Since opening a year ago, Swingers West End has – alongside Swingers City – become one of London’s most popular leisure concepts, where over 300,000 people have enjoyed crazy golf, world class cocktails, delicious street food from some of London’s leading restaurateurs and music from top DJs. To a celebrate a fantastic first year of trading, Swingers will be offering half price crazy golf for only £5 and installing a giant prize wheel at the reception of their Oxford Circus location. Everyone who visits and buys a £5 round of crazy golf will be given the chance to spin and win one of the amazing prizes on offer, as well as the chance to enter the prize draw for exclusive VIP party for up to 10 people. There is a guaranteed food or drink prize for every guest to kick-start the birthday celebrations. After spinning the wheel of fortune, guests can head over to one of the four bars where expert bartenders will be on hand to serve up – alongside the usual Swingers bar menu – an exclusive birthday cocktail, The Tuscan Tonic. For only £5, guests can get into the party spirit and sip on Belsazar Vermouth Red, Campari, Double Dutch Pomegranate and Basil Tonic with a physalis and lemon zest garnish. No birthday is complete without a delicious bite to eat and the food vendors at Swingers West End have created a special birthday menu, featuring some of their most popular dishes for the celebratory price of £5: Burger legends Patty & Bun will be serving up their infamous Ari Gold burgers alongside their veggie special – the Dig It burger. Pizza lovers can get stuck in to a Margherita or Chorizo pizza from Made of Dough. Breddos Tacos will be dishing up their Masa Fried Chicken and Smoked Sweet Potato tacos and for those with a sweet tooth, there will be a boozy Choco O’Oreo milkshake from Hackney Gelato. After a competitive round of crazy golf, guests can strike a pose on the winner’s podium where they can capture the moment in all its glory using the exclusive 10 camera, 3D photo technology.